There are two established spectral techniques to measure the disc inner radius: (1) The “Fe line” method – the fluorescent Fe K-alpha line will be broadened by relativistic effects, which are a function of the inner extent of the disc. 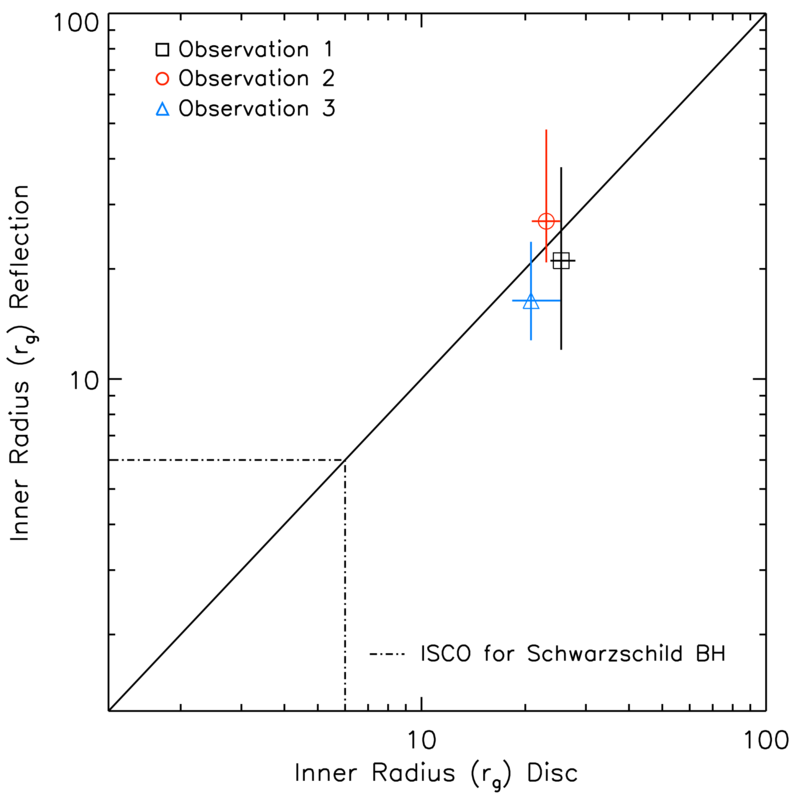 (2) The “disc method” – the normalisation of the thermal quasi-blackbody accretion disc spectrum is determined by the (apparent) size of the disc. There are many studies utilising these techniques, but the evidence for and against disc truncation is equally strong. One recent study simultaneously applied the two methods to a number of archival observations (Kolehmainen et al. 2014), but worryingly the two techniques were found to disagree. On October 29, 2013, we observed the black hole X-ray binary GX 339-4 three times over four days using ESA’s flagship X-ray observatory XMM-Newton. This caught the source during the decay of a bright (peak ∼5% Eddington luminosity) failed outburst, whilst it was in the canonical low-hard state. We observed the source at a low enough flux to utilise a rarely used science mode, the “small window mode”. This presented us with spectra covering 0.4-10 keV; in contrast, the commonly used “timing” mode is restricted to above 0.7 keV. This delivered an unprecedented view of the weak thermal signature associated with the accretion disc, and the level of photoelectric absorption (both key to method 1), whilst still allowing us an excellent constraint of the Fe line (method 2). We measured the inner radius of the accretion disc through the two methods simultaneously: we found that the two techniques agree and the results were consistent over the three epochs. The figure above compares the radii simultaneously measured via method 1 (y-axis) and method 2 (x-axis) showing that the inner disc is at 20-30 gravitational radii, and is therefore truncated from the innermost stable circular orbit (6 gravitational radii for a zero spin black hole).